The Belgian court of appeals in Brussels found two of those who were responsible for the website of the Belgian Islamic Center (Centre islamique belge, CIB) guilty for inciting to racial hatred. In total they stood trial for six charges. 29 year old Abdel R. (Rahman Ayachi) and 33 year old Raphaël G. (Gendron) each got a fine of 2,000 Euro, half of which is conditional. The court dismissed two charges of Holocaust denial, as the defense attorney, Sébastien Courtoy, requested. The judge in the first instance sentenced the accused for ten months, half conditional and a fine of 25,000 Euro, for all charges. The most important charge for Holocaust denial involved a video montage of a minute which was circulated on assabyle.com, the CIB website. 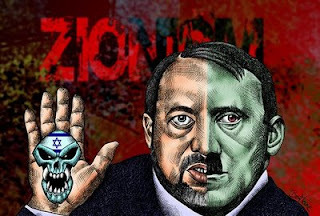 In it the rhetoric and gestures of the former Israeli Foreign Minister, David Levi, were compared to those of Adolf Hitler. Parallels were also drawn between the military actions of the Nazi troops and certain operations of the Israeli army.The document was drawn-up by Lebanese students and circulated abroad. The two accused copied it and circulated it in Belgium. The court took into consideration Friday that the accused "hadn't the intention at all to deny, minimize, justify or approve the genocide by the Germany national-socialist regime during World War II. On the contrary, namely to remind and to emphasize its atrocities by a comparison which can appear shocking, and which they blame the Israeli government." The civil charges by the Center for Equal Opportunities and Opposition to Racism (CGKR), and those of two people, on an individual basis, were accepted. 34 others were rejected. 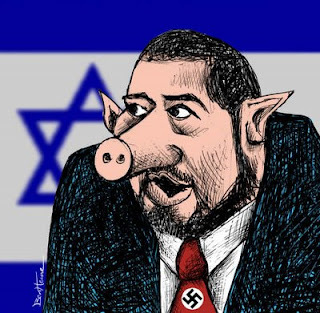 Well, depicting an Israeli politician as Adolf Hitler and as a Jewish Nazi pig seems to be OK.